Friday Night NRL cannot get any more enticing with defending premiers North Queensland hosting premiership favourites Brisbane in a replay of last year’s Grand Final. The Cowboys and the Broncos have been the standard this year and will stage another classic this Friday. Brisbane have won 30 of the 44 matches played against North Queensland with the Cowboys claiming just 12 matches. The teams met earlier in the year with the Broncos winning 21-20 in a thriller, similar to the scintillating Grand Final staged between the two teams last season. The Cowboys have had the best of it in recent years with four wins in the last seven encounters. North Queensland have won 5 of the last 6 played in Townsville with a total of 41-plus in 4 of the last 5 outings. Anthony Milford has scored in 4 of 8 games v the Cowboys while Michael Morgan has scored in 9 of 12 v Brisbane. North Queensland are 4th on the ladder with a 7-3 record though their +139 differential ranks 2ndin the NRL. North Queensland’s attack ranks second in attack while they are third defensively. The Cowboys had won five straight – posting 32-plus in four of those wins – before going down to the Storm at Suncorp 15-14 last Sunday. The three Cowboys losses this year have all come by fewer than four points. Brisbane are the premiership leaders with an 8-2 record and the best differential in the NRL at +159. They rank top defensively and second in attack while they are 2-2 away from Suncorp this year. They have won 6 of their last 7 and have scored 26 in each of their last five while conceding single digits in four of those. State of Origin speculation won't affect tonight's clash between the Cowboys and Broncos, says Brad Fittler, who concedes that he still can't split the two teams. 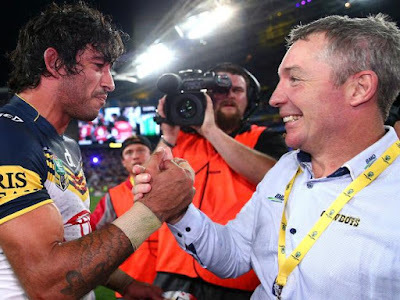 Brisbane took out a 21-20 golden-point victory over the 2015 premiers at Suncorp Stadium in round four, with North Queensland now hoping the Townsville faithful can help them get across the line in Johnathan Thurston's 250th NRL game. "Golden point," tips league great Fittler without a hesitation. "It'll go to the wire. They don't know how to stop fighting, and I think the way the referees go they go with momentum and then all of a sudden what happens is one team gets a bit of momentum and they're too good not to score points." Kevin Walters will name his first Queensland Origin team on Tuesday, with the new coach expected to stick to the familiar names that found so much success under Mal Meninga. Fittler believes the pressure of this No.1 v No.4 clash won't have an effect on the potential Origin players taking part.